It’s the time of the year again when families all around North America reunite and celebrate the autumn harvesting season with Thanksgiving. If you’re hosting this year, it’s the perfect time to show your guests what Paleo is all about and that healthy food is in fact also really tasty. The stars around Thanksgiving are the meat and vegetables usually seen in North-America at this time of the year. Turkey, beef, sweet potatoes, pumpkins, cranberries, mushrooms and apples are all standard fare. What I’ve decided to do here is create a complete menu including the main Thanksgiving turkey with the sauce, stuffing and cranberry sauce as well as juicy rib roast, appetizers, vegetable sides and even a classic dessert, the pumpkin pie, all in Paleo fashion. Of course, simple olive, fruit and cheese platters are also welcomed by everybody to snack on, but the recipes included here will produce enough food to fill even the hungriest. Some Thanksgiving recipes are already perfectly Paleo, but some needed to be adapted somewhat. The cranberry sauce presented here is a tarter version than the traditional one, but I think it’s an even more interesting taste to contrast with the turkey and stuffing. The stuffing, for its part, is made out of lean ground beef instead of bread and is absolutely amazing and tasty. Be aware that some of your guests will probably want to steal your recipe. Finally, the pumpkin pie is made on a nut crust and is lightly sweetened with some honey instead of being a massive sugar vehicle. I hope that you and your family will enjoy preparing and eating those delicious recipes and that your house will become the favorite place to have a Thanksgiving dinner for the whole family. The turkey is the centerpiece of most Thanksgiving dinners and is at the heart of this November tradition. The wild turkey being native to the North American forests, I couldn’t think of a better animal to feast on to celebrate the local harvest. Of course, now that Thanksgiving has been commercialized and some of its essence lost, so is the traditional turkey. Now turkeys are bred and selected for larger and larger breasts for more and more white meat, probably because of our global fear of fat. This means, unless you source some heritage turkey or hunt wild turkey yourself, that you’ll have to pay more attention during the cooking process not to end with dry meat. You’ll want to make sure not to overcook it and to baste it really often. A kitchen syringe is also a good idea here, to inject some juices into the meat itself. It goes without saying that getting a turkey that has been properly raised and fed is really important not only for the advantage in taste, but also the health benefits of a better fat ratio and fewer toxins. The difference is worth the price. 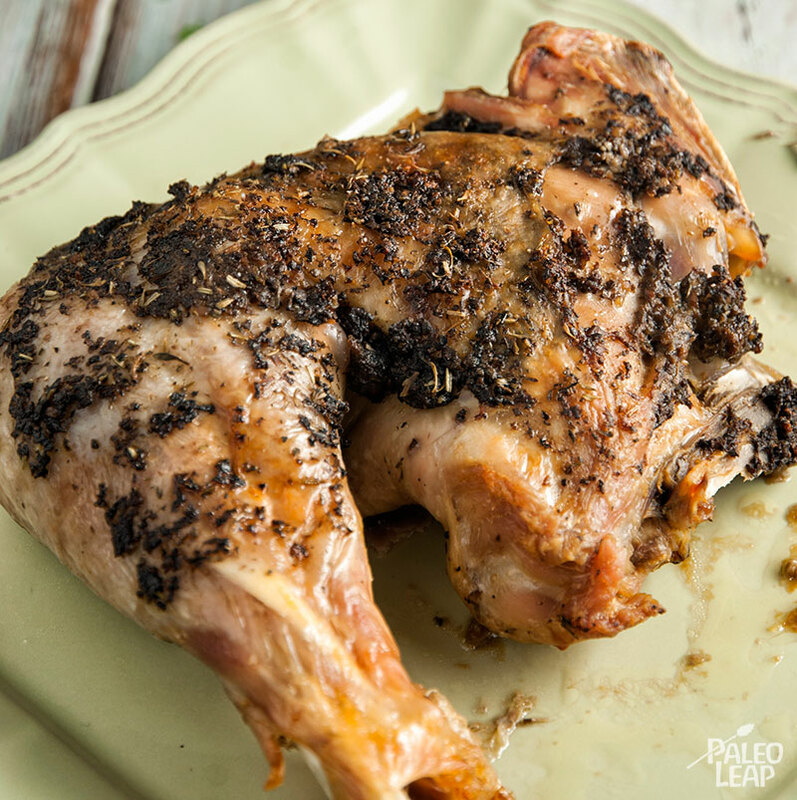 The little twist in this roast turkey recipe is in the use of dried wild mushrooms to create a delicious flavored butter that will help cook the turkey and also be an integral part of the final sauce to serve with the bird. The sauce is created with the cooking juice so it’s very simple to prepare without even thinking about it. 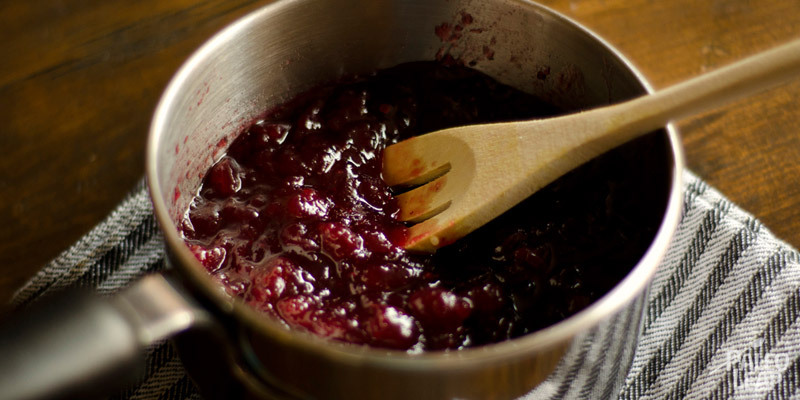 Turkey is almost always served with a sugary cranberry sauce at Thanksgiving, but this sauce doesn’t have to contain that much sugar to be delicious. Of course, cranberries on their own are very tart, but in this recipe a cup of orange juice is added for a nice orange taste and to cut the tartness. No extra sugar needed. As an added bonus, this sauce is so easy to prepare, you could probably do it with your eyes closed. This recipe gives a cranberry sauce that’s a bit more tart than usual, but you’ll probably end up liking it even more than the cranberry sauce you used to know. At this time of the year, you shouldn’t have any problem finding fresh cranberries, but you can always use frozen ones. Who says turkey stuffing absolutely has to be made out of bread? Cooked outside the bird, stuffing was traditionally called dressing, but now the names seem to be interchangeable. This version made with lean ground beef, celery, apples and walnuts tastes amazing and is way, way healthier. The ground beef has to be very lean not because we are scared of the fat in any way, but because the fat changes the taste and texture and creates something much different looking and tasting than a traditional stuffing. 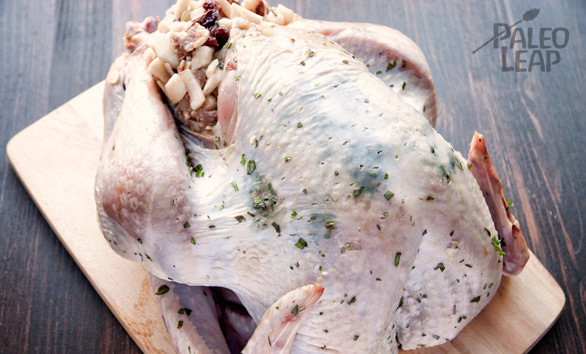 With the celery, apples and spices used, the aroma and texture will be very similar to the traditional stuffing. The usual spices used in a turkey stuffing are often sold in a mixture called a poultry mix and include rosemary, sage, thyme, and marjoram. Of course, the result will be much better if you chop your own fresh herbs than if you buy a dried version of them. In a large pan, sauté the ground beef and celery with the cooking fat for about 3 minutes. Make sure to crumble the ground beef to small pieces. Add the diced apple and onion and continue sautéing for another 2 minutes. Add the fresh herbs or poultry mix, minced garlic, walnuts and season with salt and pepper. Mix well. The meat should still be somewhat pink; it’ll finish cooking in the oven. Put the mixture in a baking dish and bake uncovered for about 30 minutes in the preheated oven. If you have a very large family and turkey alone turns out to be not enough, rib roast is another Thanksgiving classic and a great second main to serve. A prime beef rib roast is often an expensive piece but it results in a meat that’s so delicious and juicy that you’ll remember this year’s Thanksgiving for a long time if you prepare this recipe. The cooking process creates a wonderful juice that we’ll use to create the sauce with the addition of green peppercorns. Cut some of the excess fat on the rib points and the roast itself. This fat will help in creating the sauce later on. Put the fat parts you just removed in a roasting pan, add the carrot, garlic, onion and thyme and season to taste with sea salt and black pepper. Add some generous knobs of butter or your chosen cooking fat. Place the pan in the oven and roast the mixture for about 20 minutes, until golden. Remove the pan from the oven, place the roast on top of the vegetables and fat parts and season it with salt, pepper and some more thyme. Add three generous knobs of your chosen cooking fat. Place the pan with the roast back in the oven and roast for 45 minutes. Lower the oven temperature to 350 F and cook for another 45 minutes for a medium-rare roast. Remove the pan from the oven and remove the roast from the pan. Set the roast aside, loosely covered with a piece of parchment or aluminum foil for about 15 minutes. In the mean time, put the roasting pan on the stove top and deglaze it with the red wine, making sure to scrape the pan well with a wooden spoon. Boil and reduce the liquid to 1/3. Add the beef stock and boil for another 5 minutes. Add the green peppercorns and crush them with the back of a fork. If desired, the sauce can be strained to remove the peppercorn bits. It’s perfectly fine otherwise and gives a more rustic final sauce. Serve the hot sauce immediately with slices of rib roast. 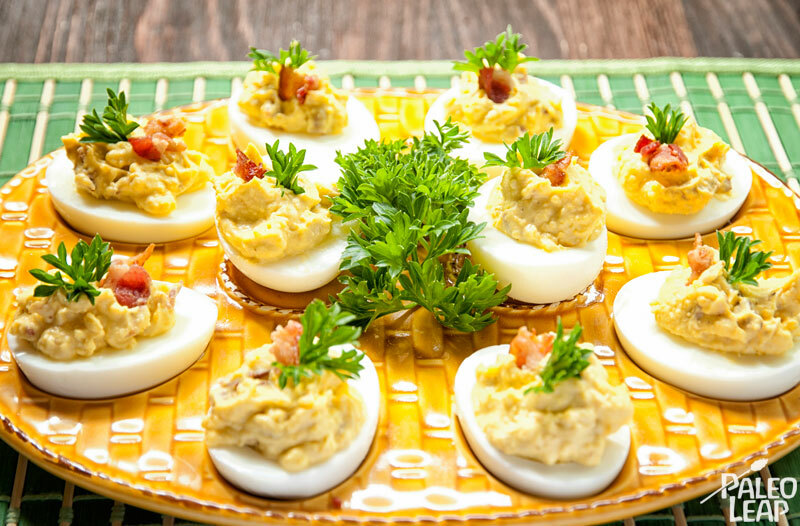 Deviled eggs are a classic Thanksgiving appetizer and they have the advantage of being very easily prepared so you have more time to spend with the turkey or your guests. They’re also universally loved, especially in this recipe where bacon bits are added and you’ll even have to watch the kids so they won’t end up being full before the main course is served. Cook the bacon slices in a pan over a medium heat until crispy. When the bacon is ready, let cool. Crumble the bacon to small bits. Place eggs in a pot filled with cold water. Bring to a boil and let boil for 12 minutes. After the 12 minutes, remove from the heat, drain and run some cold water immediately on the eggs. The cold water will cool the eggs so you can work with them, but will also stop the cooking process. You’ll often see overcooked eggs with a grey-colored edge to the yolks. Once the eggs are cold enough to handle, peel them and cut them in half. Carefully scoop out the yolks and mash or whip them in a bowl with the mayonnaise, mustard, bacon bits, cumin and salt and pepper to taste. With either a spoon or a piping bag, fill in the cavity of the egg white halves with the yolk, mayonnaise and bacon filling. You can make a piping bag from a plastic sandwich bag by cutting off one corner. Be careful not to make the hole too large. Garnish with some paprika and some of your favorite fresh herbs. Mushrooms are often forgotten on a Paleo diet, but they are definitely healthy and tasty additions. On top of it, they’re widely available and cheap. This is another easy to prepare, yet fancy appetizer that will be perfect for your guests to start changing their minds about your diet choices if they used to think that Paleo isn’t tasty or is only for extremists. 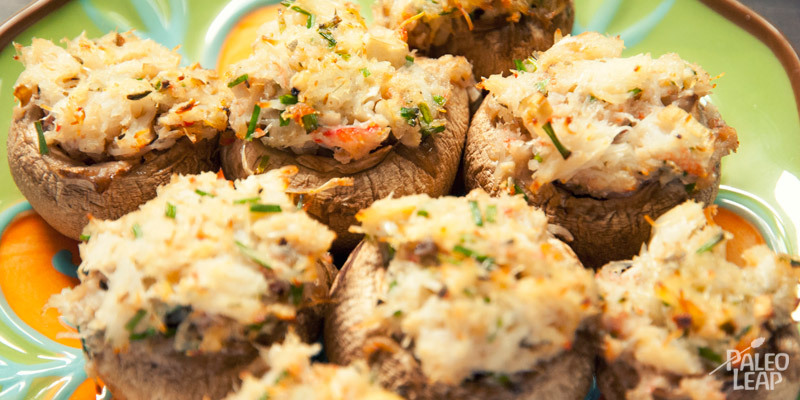 Mushrooms are often stuffed with some form of cheese, but these crab stuffed ones are just as delicious. Simple white button mushrooms are perfect here, but feel free to use any mushroom that has an opening big enough to stuff. Scoop a generous portion of the stuffing into each mushroom cavity and bake in the preheated oven on a baking sheet for about 15 minutes. Let cool a bit, but serve when still warm. Typically, a starchy side of macaroni, mashed potatoes or mashed sweet potatoes is served on Thanksgiving. To make things a little different while keeping the spirit of bulkier and orange autumn vegetables, I’ve included here a roasted cubed sweet potato with rosemary. Rosemary is a strong-flavored woody herb that’s perfect for the occasion. Other than a great taste, rosemary also features strong anti-oxidant properties, but feel free to use any woody herb like thyme or sage in place of the rosemary in this recipe. If available to you, yams are a good substitution for the sweet potatoes. Be aware though that sweet potatoes are often confused for yams and are generally not marketed to North American grocers. Place the sweet potato cubes and smashed garlic in a pot filled with salted cold water, and bring to a rolling boil. As soon as it boils, drain the potatoes in a colander and let them steam and dry a bit. Discard the garlic cloves. Meanwhile, using a mortar and pestle, grind the rosemary leaves somewhat to release the oils. 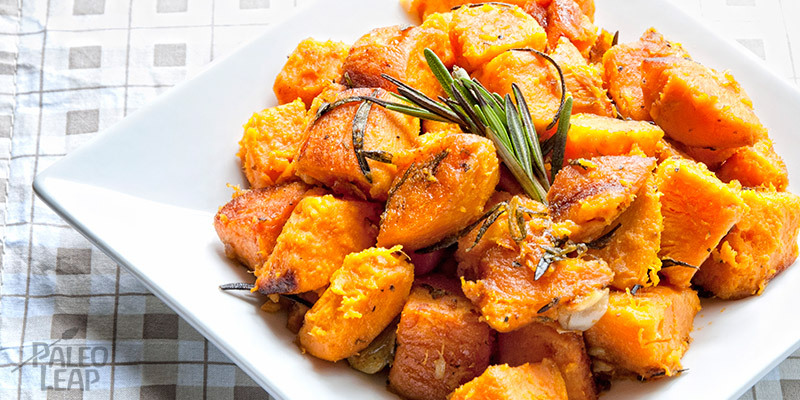 Heat a roasting pan on the stove top to a medium-low heat, add the fat, rosemary, sweet potato cubes and season with salt and pepper. Without cooking anything, mix everything well together. Place the roasting pan in the oven and roast for about 20 to 25 minutes, until crispy and tender. Stir the potatoes occasionally during the cooking process for an even cooking. Orange vegetables are the bomb around Thanksgiving time. Sweet potatoes, yams, butternut squash, carrots, the choice is yours. Here is a simple yet delicious side of carrots that you’ll find tastes amazing in spite of the simplicity of the dish. Mix the garlic, orange zest and parsley and chop together until very fine. Rub the inside of a baking dish with your chosen cooking fat and sprinkle some of the garlic, zest, and parsley mixture on the dish. Line the bottom of the dish with a layer of carrot slices, brush some olive oil or cooking fat on top, season lightly with salt and pepper and sprinkle some more of the garlic, zest and parsley mixture. Repeat step 4, layering carrot slices until you go out of carrots. Make sure to add some fat, salt and pepper and sprinkle some of the garlic, zest and parsley mixture between each layer. Top with the orange juice and just enough chicken stock to cover. Line a piece of wax paper on top of the carrots so the top layer doesn’t dry out. 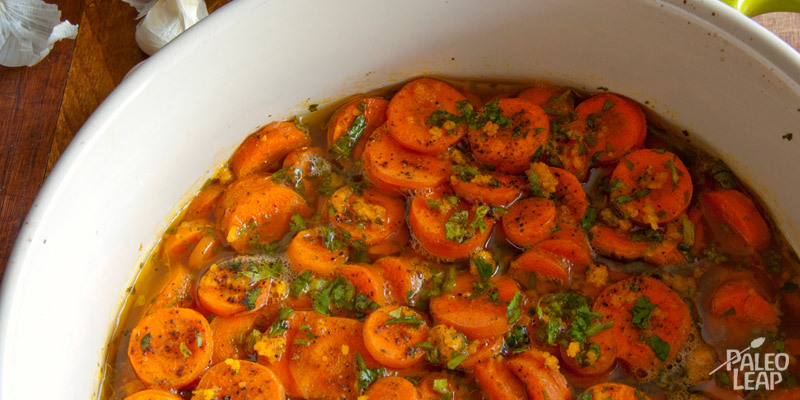 Place in the hot oven and bake for about 20 to 25 minutes, until carrots are very tender. 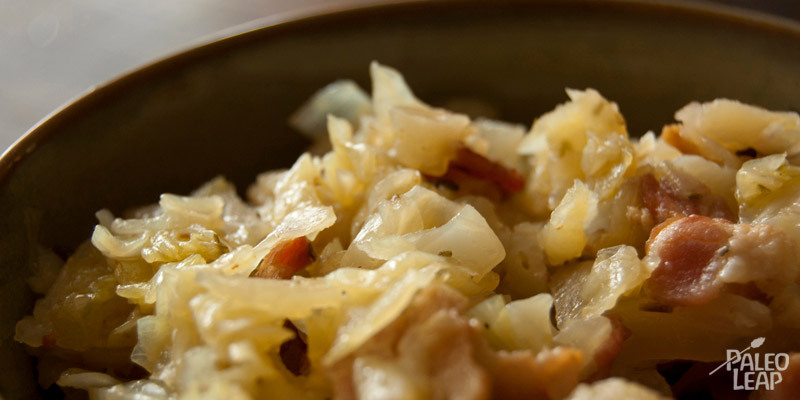 This is a simple and delicious side to either the turkey or the beef roast and the bacon adds a savory dimension to this braised cabbage recipe. It acts as the usual green vegetable side served with a Thanksgiving dinner. The key here is to have a very finely chopped cabbage and it will cook really fast. Bring the stock, bacon and thyme leaves to a boil in a large pot on the stove top. Add the cabbage, boil for 5 minutes and then reduce to a simmer. Simmer the cabbage until just tender to your taste. Add some stock during the simmering process if you feel it reduced too much. Add the butter, lard or duck fat, season to taste and serve immediately. In an effort to bring you a traditional Thanksgiving dessert that all the family will adore without questioning your Paleo diet background, the pumpkin pie was a clear winner. In fact, pumpkin pie is the quintessential Thanksgiving dessert. 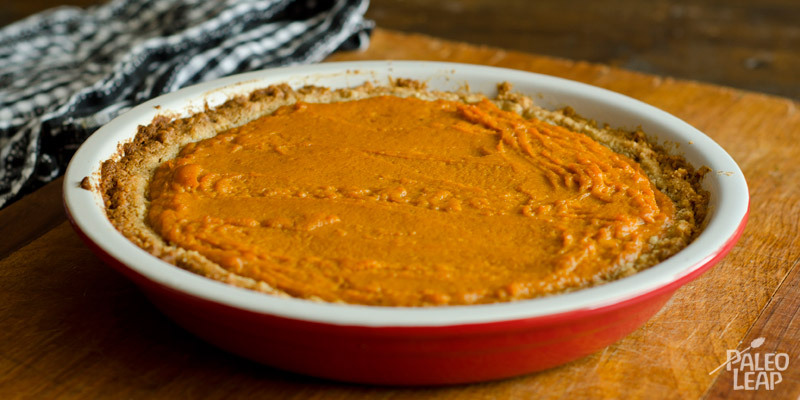 Of course, the usual pumpkin pie is made with lots of sugar and a flour based crust, but nothing prevents us from making an even more delicious fresh nut crust with hazelnuts and pecans. As for the sugar, well, here a compromise is made and the chosen sweetener is honey. While honey is natural and non-toxic, it’s still high in fructose, but the amount you’ll end up eating with your hot and delicious piece of pumpkin pie is really not such a big deal, especially in this time of feast when other, nastier, indulgences are always around the corner. Treat yourself with a large piece of this pie when still hot with a big portion of coconut vanilla ice cream. This recipe calls for pumpkin puree. You can either buy canned pumpkin puree, making sure it’s the only ingredient, or you can roast some fresh pumpkin in a 350 F oven for about an hour to make your own puree. Process the nuts in a food processor to almost a flour consistency. Be careful not to process too much or you’ll get a butter instead. In a bowl, mix the ground nuts with the butter or coconut oil and then spread the crust mixture in a pie pan and bake for 10 minutes. While the crust bakes, mix all the filling ingredients together in a bowl. Add the filling evenly on the baked crust and bake for an additional 45 minutes.